ARCOMPANY | I’m B2B: Use Social Media … Who Me? Home / Future Of Business / I’m B2B: Use Social Media … Who Me? I remember when business executives used to sit in a senior meeting and use their brand new Blackberries to text each other on the “sub rosa” (a Latin phrase connoting secrecy) topics of the day, all the while, seeming to pay attention to the meeting in progress. Perhaps this was an early form of “texting” social media? So, has social media progressed? Today, many think social media is just a communications tool to spread online gossip or just an entertainment vehicle to satisfy what “enquiring minds really want to know”. Well, in my humble opinion, nothing could be further from the truth! Business people have been using social media for several years, but are they simply using it to create a presence or are they actually listening and extracting social intelligence from the “social media universe”? And are these business people B2C (business to consumer), or can B2B (business to business) organizations also leverage social media to positively impact their business results? It is now (almost) common place for a number of business people to be connected on a Google + Hangout, “videocollaborating” (a new term for videoconferencing), while utilizing the chat facility to pass around relevant information, such as URLs of websites, YouTube videos, reference blog articles and so on. It’s real time multi-media collaboration on ‘roids (or Performance Enhancing Drugs – PEDs – in the modern day sports lingo). Today’s Social Media goes way beyond athletes, young kids and a remote internal business meeting collaboration. The “Social Media Universe” consists of hundreds of social media services, blogs, RSS feeds and so on, that promote info sharing, collaboration and even the purchase of products and services. But are business people leveraging these social media services and forums to ask questions about products, services and issues that affect their business? And with services like LinkedIn, there should be a huge attraction for business people to participate with their global peers in a wide variety of LinkedIn Groups, like the Telecom Executives Group, or the Sales Management Group and so on. But is it really happening? And perhaps more importantly, are these businesses going beyond simply using Social Media tools, and trying to derive business intelligence from Social Media? Social Media for Business, once the sole purview of PR / Media people for managing brand reputation and Human Resources groups for hiring, is now beginning to take hold for the operational parts of the business. This includes Sales for lead generation, Marketing for feedback on product features and specs (the new wave focus group), and Customer Service, well … for more effective customer service. The operative word here though is “beginning”. One of the so called reasons for the slow uptake of Social Media by the business community was the incorrect assumption that Return on Investment (ROI) could not be quantified. But today we are seeing “the early adopter” type companies improve turnaround time on resolving customer issues through the use of social media channels, and with costs that are often reduced below that of typical “telephony based contact centre” approaches. Again the operative phrase here is “the early adopter”. Recently NM Incite, a joint venture between Nielsen and McKinsey & Company published a study entitled The State of Social Customer Service 2012. It highlights the importance of organizations providing social media users with prompt customer service through the social media channels the customers prefer to use, mostly Facebook and Twitter. This type of customer service has become known as “Social Care”. So how is Customer Social Care progressing? The NM Incite study found nearly 1 in 3 social media users prefer to reach out to a brand for customer service through a social channel compared to the phone. Interestingly, of those who reach out to use Social Care, only 36% report having their issue resolved quickly and effectively. That means that many organizations are not equipped to handle the situations being presented in Social Media or are failing in their attempts. Customer expectations from Social Care are very high. The majority of Twitter and Facebook users expect a response within the same day of posting. More than half the Twitter users expect a response within 2 hours! In a different operational area, we are now seeing innovative medium size companies that want grow by “disrupting” their industry, through utilizing Social Media to find and qualify new customer lead opportunities. Businesses are even fostering new relationships through trusted forums and effective Social Media Community Management. It’s a great time to be a disruptive business! Because, the groundswell for social media began with consumers, B2C companies were the first to get on the social bandwagon. 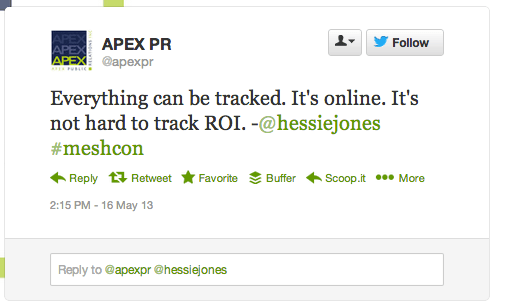 However, B2B companies are beginning to recognize the value of leveraging Social Media. A recent article by Marketing Charts collected some very interesting data on the use of Social Media by B2B companies from a recent analysis by Forrester Research. 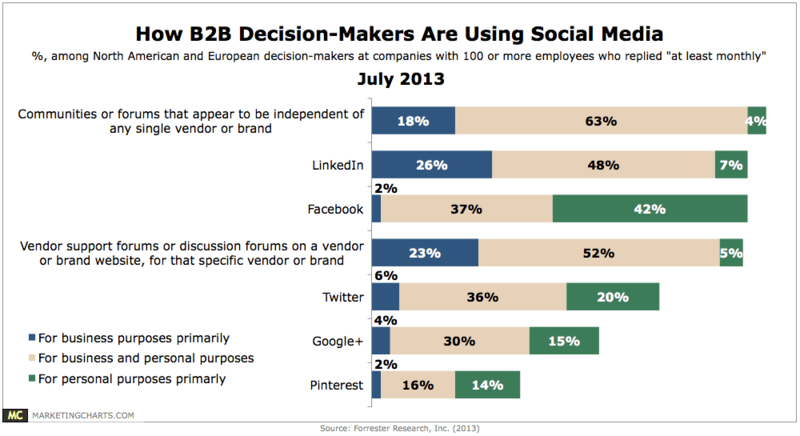 Social media use is ubiquitous among B2B decision-makers in North America and Europe. That said, their (B2B) motivations for using various platforms differ greatly (from B2C businesses). The data suggests that among popular sites, Facebook is rarely used primarily for business purposes, while Google+ and Pinterest are still lagging in adoption rates overall. 32% use Pinterest at least monthly, but only 2% do so primarily for business reasons. LinkedIn and specialized Forums (both branded and brand agnostic) are the key places where B2B Business people spend their “social media time” (for both business and personal reasons). They are connecting with colleagues and collecting information on business products, services, trends and other attributes of the businesses themselves. They are trying to learn how to play in this “brave new social media world”. While the results suggest that B2B decision-makers use the major social media platforms for both consumption and interaction, it is very important to note that they do not simply play a passive role, but rather are actively engaged. Specifically, the Forrester study identified that while 98% are “spectators” (reading blogs, watching peer videos, etc. ), a startling 75% are also “critics” (commenting on blogs and posting ratings and reviews) and 56% are “creators” who publish posts and upload visual media. Although it is still early days for B2B Businesses leveraging Social Intelligence to directly impact their business results, the trend is clear … its coming! If you are a B2B company or marketing to B2B companies, ignoring social media will “cut off” an excellent source of “Social Intelligence” about new customers and an effective method for enhancing long term customer relationships. Your decision here will affect your bottom line results. ArCompany is a Canada / US based Social Media consulting services firm that builds solutions for Fortune 1000 clients and aggressive start ups. It is ArCompany’s belief that Information and intelligence technologies are moving at a faster pace than many organizations can keep up with. The social media universe is the untapped conduit for raw, customer-volunteered information. It is high quality and often unseen by many companies. ArCompany believes businesses that can adapt and leverage this information to their benefit will be ahead of the curve. They will be the drivers of change; they will be the leaders in their marketplace. They will demonstrate what it means to really listen and understand their customer. They will show the world how to succeed by elevating the relationships with their customers and focusing resources to meet and exceed market needs and expectations. Business-to-Business (B2B) companies that do not already have a social media strategy or a listening platform are at risk of being left behind. While social media and Business-to-Consumer (B2C) companies are natural bedfellows, organizations selling to businesses no longer have an excuse to avoid the data that social media creates. But still, many B2B companies hesitate to develop and implement social intelligence strategies because they aren’t sure that the same opportunity exists for them in social media. Hofer-Shall’s Forrester Research Group survey showed that early B2B adopters see value in listening to social media, and they are already developing social intelligence strategies and seeing real business results. As a B2B company, can you leverage the Social Media Universe for your business advantage? Let’s talk about that. Social Selling ... Are B2C Blogs Worth The Effort?